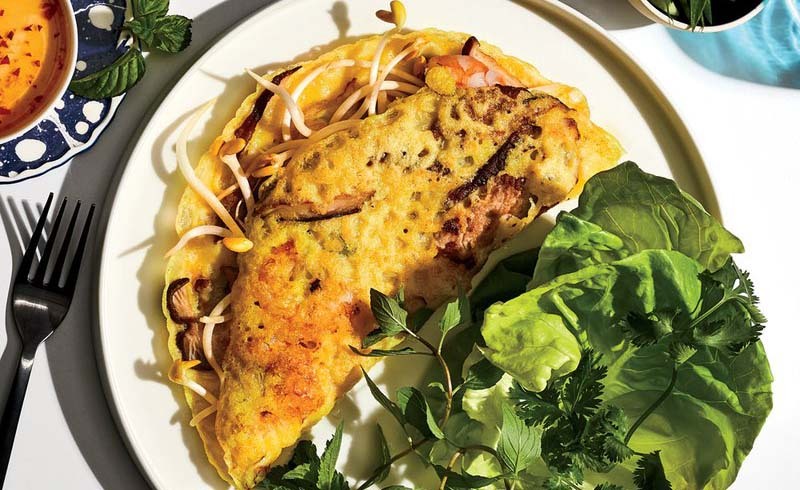 This Vietnamese rice pancake is filled with shrimp, mushrooms, pork, and more. 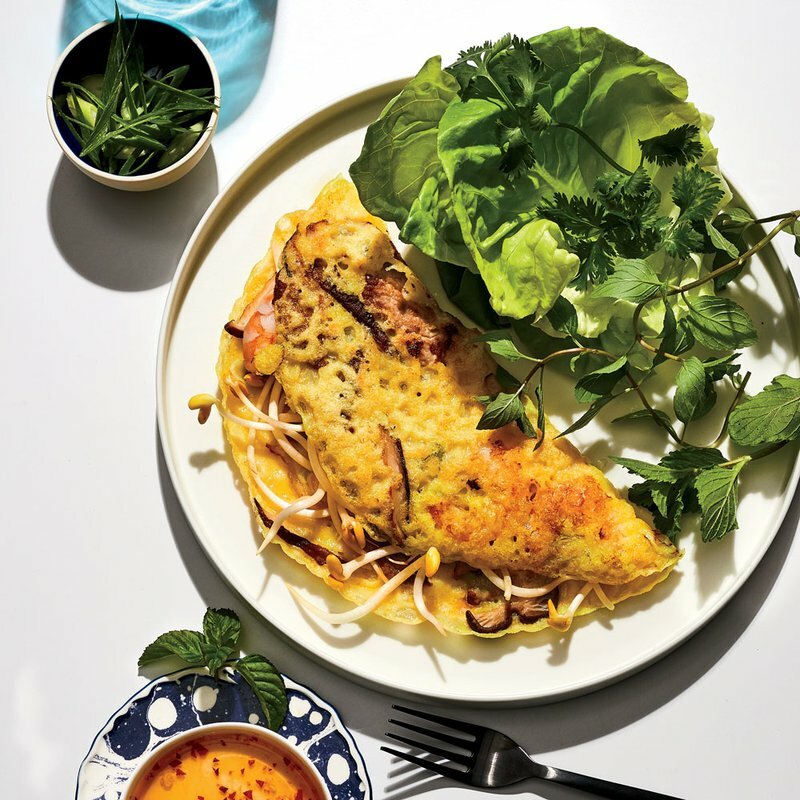 In 1989, Binh Duong, a Vietnamese refugee turned chef, owned one of the buzziest Vietnamese restaurants in America, Truc Orient Express in Hartford, Connecticut. Jacques Pépin was a fan. So was F&W’s associate test kitchen director Marcia Kiesel, who wrote that Duong’s dishes had “a balance that appeals to the shyest or most cosmopolitan palate.” Exhibit A: His bánh xèo, crisp and lacy rice crêpes colored with turmeric and studded with caramelized onions, shrimp, pork, and bean sprouts. The Vietnamese name of the dish translates to “sizzling cake”—so called for the sizzling sound the batter makes when it hits the pan. Using a mortar and pestle, pound chiles, garlic, and sugar until mixture resembles a slurry, about 3 minutes. Stir in fish sauce, lime juice, and 2 tablespoons water until blended. Set aside. Whisk together rice flour and 2 1/4 cups cold water in a medium bowl. Whisk in scallion and turmeric until blended. Set aside. [post_ads]Preheat oven to 200°F. Heat 1 1/2 tablespoons oil in a 10-inch nonstick skillet over high. Add 3 pork slices, 3 shrimp, and a few mushroom and onion slices. Sprinkle with 1/8 teaspoon salt and 1/8 teaspoon pepper. Cook until pork and vegetables are lightly browned, about 30 seconds per side. Stir rice flour mixture. Remove skillet from heat. Holding skillet at an angle, pour in 1/3 cup rice flour mixture, and swirl to evenly coat bottom of skillet. Return skillet to heat over medium. Cover and cook, undisturbed, until sides of pancake turn deep brown and curl up, about 5 minutes. Remove skillet from heat, and sprinkle 1/4 cup bean sprouts over pancake. Fold in half, and transfer to a baking sheet; keep warm in preheated oven. Repeat procedure with remaining oil, pork, shrimp, mushrooms, onion, salt, pepper, and bean sprouts to make 9 more pancakes. Arrange pancakes on a large platter, and serve warm with dipping sauce.